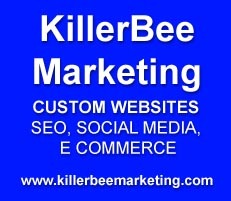 KillerBee Marketing is Bent on Creating a "Buzz"
SEO Certifications, new hosting company new to this website design firm. Cheri states “With our dedication to our customers and our new hosting company I believe we are poised to have a great 2012.” She just may be right if early customer feedback is any indication! KillerBee Marketing is a web design company that now specializes in SEO and website hosting, with the best and brightest web designers and digital artists. Founded in 2009, and with the new co-owner Cheri Morey, they’ve just added a pro to the team, who brings more than 15 years of web design experience. They are not a company you’d find on a local street corner but it doesn’t stop them from providing a superior customer experience.